Once again, the low tech Haitian Donkey wants to send out just a few notes of update. The rest of the trip went well, we had no rain and thus could make the trip back to Port in the wee hours of Saturday with our bunch of luggage remaining dry on the roof. 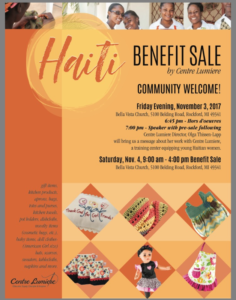 Per usual, our teams often bring stuff back from the Centre Lumiere, the center located within walking distance of the hospital where our otherwise destitute ladies make beautiful products from scratch on supplies purchased and sent to Haiti from the US, which we bring back here and thus raise funds to continue the ministry. The ladies have Bible teaching each day and many become believers in their years of training there. The center has had a fair amount of damage from the hurricanes and is still being repaired/refurbished by Caleb and Olga, but they are going to have 3 USA sales in the next few months. 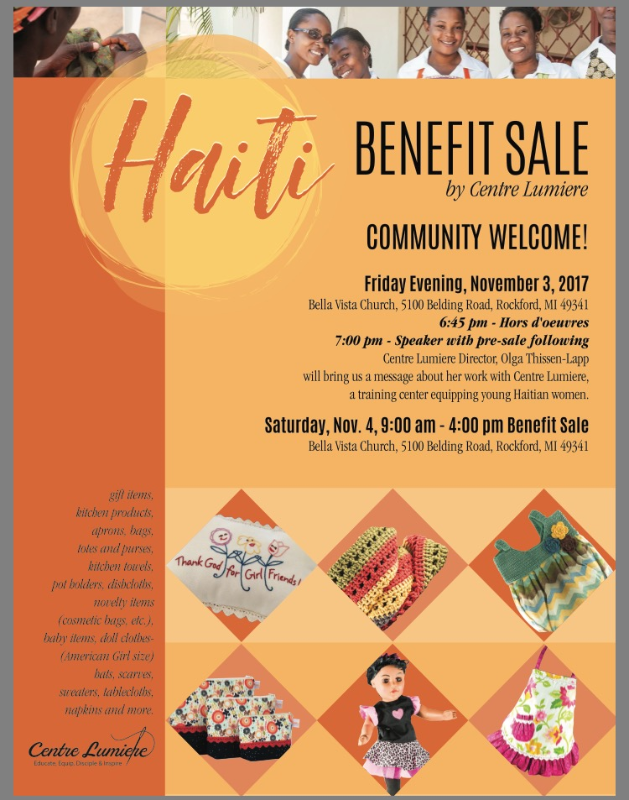 The first (the flier is redone below) will be Friday the 3rd of November and Saturday the 4th in Grand Rapids at Bella Vista Church. The next will be in the Bluffton area a few days later. Thus, Evert and I took 4 large suitcases home full of supplies for here and Zella had 2 more for the Bluffton area, as she teaches there. So, wanted to be sure I got the news out to those who would be interested in supporting this ministry or getting to know more about it, as, like the hospital, we reach out to people by helping them with their physical (financial and medical) needs and then we get to tell them about their spiritual needs of Christ. We arrived home without trouble, though the chilly reception we had in Grand Rapids (in the 30’s while the 1 am departure was in the 90’s with 95% humidity, even I don’t wear more than scrubs and flip flops and love it) was a bit of a shocking return to reality. I continue to be amazed and thank the Lord for all the crew was able to do during our week of service there. Miss Lisberthe, our OR head nurse, and Miss Catherine, the head nurse for the rest of the hospital, asked Tabitha’s sister to come back a couple times a year to help organize things in the storage rooms, so it was profitable in that aspect also. We have a lot of the downstairs of the hospital cleared, so are well on the way towards getting ready to tile the downstairs of the hospital, though the teams in early 2018 will make considerably more headway on getting the walls and floors ready for that huge job. The first container arrived in less than a month and a bunch of supplies are stored, the second is on the way already. Dr. Luke will come this weekend for the November surgical week, also Duane and his crew as well as Dr. Luke’s nurse mom, plus Dr. Jo Marturano (psychiatrist) and Beth Newton, so they can work on the psychiatric clinic as well as the surgery aspects. We would appreciate prayer for wisdom for these tasks to be done smoothly and in a way that glorifies God. Also for safety for the teams as protests continue as the country becomes more chaotic without much law enforcement (with the UN pretty much gone). Lastly, it is once again headed towards the end of the year and we would like to ask those who have had an interest in the “rice and goats fund” if they would feel God leading them to contribute to this again. In the 7 years we have been able to do this, it has been a great source of encouragement to our employees and myself. As funds allow, we start at the lowest paid employees and share the benefits with all those possible. The Haitian Goude has not done so well on the international scene and, since so much of Haiti is dependent on goods imported from outside, inflation has been rising at a runaway rate. This has especially hit the lowest paid employees as their food costs are such a large part of their living costs. We help them as our funds allow, but this special event is such a great encouragement as it is given as we remember the great gift that God gave us at Christmas for our salvation and eternal life. Again, for those concerned that the gift of the goat will become Christmas dinner, that is not likely to happen, as the goat is too great an investment to eat in a short period, as we don’t have refrigeration to keep the meat safe and so it is kept to grow, reproduce and then be sold to market if a financial crisis arises (medical or other serious event). Once again, the week is almost over and we are scrambling to wrap up projects and other loose ends. Surgery has gone well, except for one lady that had a cervical cancer I thought I could remove on my pelvic exam, but when I opened her up, the cancer had spread too widely to even give it a try. Again, I get frustrated as the family adamantly refuses to let me talk to the patient about it, I am kind in the way I present it, but I feel I owe it to my patient to tell them that things don’t look so good. So, I try to give them hints when possible without truly breaking the rules. We seem to have had another rash of cervical cancers again, some resectable, many not, and have had the pastors/chaplains busy helping me encourage and counsel the poor ladies. We also had the male counterpart of the widespread virus that likely contributes to this all and had to give him a rather radical surgery. As Dr. Luke is coming in 2 weeks, I have tried to send some of the workload to him, but clinic has been very busy with patients and emergencies have completed the schedules. We had a lady with an ovarian cyst that twisted itself 360 plus degrees, she was in a ton of pain, but I sent her home today after she finally smiled at me. I needed to encourage her each day that life was improving and she finally seemed to believe it. We also have had the motorcycles supply their share of trauma, a badly dislocated elbow, a number of cracked ribs, several patients with lacerated faces, hands and legs. There also was a 40 year old gentleman who fell off his motorcycle and has a compression fracture of his back. Thus far, he does not have any paralysis, but have him on strict restrictions (as much as that means in this difficult culture). We had a young lady come in yesterday that likely had a stroke as she was pretty much unresponsive and our efforts to revive her were too little, too late. We also have had a number of infected feet, we ended up doing several rather malodorous debridements of dead tissue there as well as an amputation of her second leg on a diabetic 83 yr old lady, very sad but there really was no alternative. So far, she has turned out rather feisty in the 24 hours post-op, hope she remains that way. Today, we finally were allowed to operate on a teenager who had been treated elsewhere for 5 days and now came to see us with a painful, distended belly. It was not clear what he had, but we are so thankful for the ultrasound machine, as we were able to see some fluid outside the bowels and we removed over 2500 cc of pus from his little belly from a typhoid perforation that had been there a while. I pray that he makes it as the next few days will be rough, at the very least. We also are thankful that Evert has replaced the AC in the large OR room and added a vent fan for the less pleasant to our noses cases. Ed has repaired and replaced most of the equipment in the lab and Zella keeps finding new messes to straighten up. Miss Catherine, the head nurse, has asked if she can come back regularly to help organize things, Wow. Anyone who has come to the hospital over the years knows Madame DoDo, the little lady who “brooms” the yard all day to remove fallen leaves, trash and other debris. She has next to nothing, her family are what we could gently classify as noncontributing members of society and she was the breadwinner in the family. We had just built her a small, 2 room house so she could have a place to call her own as she was well past retirement age but adamantly refused to retire, nor could she afford to do so with such a lack of family support. Despite having essentially nothing according to the world’s standards, this lady always was cheerful, always was praising the Lord and I always gave her a hug several times during my week here as she praised Him while brooming (they don’t have rakes, if we gave them some, not sure they would use it, plus they use the broom the opposite way we do, an interesting concept), during the chapel services and pretty much 24/7. She always had a smile on her face but a week before I arrived, she was found unresponsive, hypertensive and never woke up despite a week in the hospital and we will bury her November 1. She is rejoicing in her Savior’s presence but we will all miss that 80 pound dripping wet bundle of sunshine. We have a few minutes to spend with William in Port while loading the truck, as he is busy in his residency. One of his colleagues spent the week with us and seems to be a very nice young doctor. It is hard to gauge them by William, he is so advanced, but then, even a slow teacher should impart some training in 13 years together, as we often did as many surgeries in my week there per month as many general surgeons do in a month, so they had a lot of practice. His wife made us delicious fried banana chips, which we traded some apples for with the 4 of her 5 boys she sent up last night with them. Zella also gave them books and crayons, so we had a delightful time together. So, it is now time for us to pack up our bags (actually, Olga already did pack 6 of our suitcases, as she has 3 sales in the US in the next few weeks, including one in the Grand Rapids area November 3 and 4 at Bella Vista Church in Rockford, so there is a lot of stuff we are bringing to that sale and the one near Bluffton, IN, where Zella lives and will take 2 suitcases). The little 4 cylinder diesel Kia will labor up the hills with it’s load again, I feel sorry for it, but I suppose it is just like the little engine that could, and does. We thank the Lord for all that everyone has done, from the delicious meals Tabitha and Zella made, to the repairs that Ed and Evert did (I am constantly amazed how Dudu and he get work done with the huge language barrier) to the help that Tabitha and Philipp were in the OR and on the wards. It makes the workload so much easier with everyone trying to help the others. As usual, we had a delicious meal and a good time with Caleb and Olga and good fellowship with them as well as our Haitian staff. To God be the glory for the things He hath done for and through us this week. We will leave at 1 am again and are praying we will get to the airport before the disgruntled folks have a chance to make trouble and set up roadblocks. Attached is the flyer for the event Olga is doing in Rockford this weekend. Olga runs the training center (Centre Lumiere) by the hospital. We always enjoy the dinners Olga and Caleb put on for us at their home. 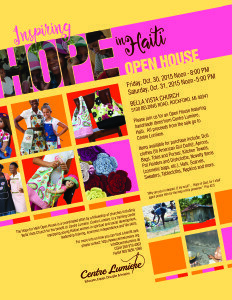 The Open House will be at Bella Vista Church in Rockford on Friday (10/30) from Noon- 8pm and on Saturday (10/31) from Noon – 5pm. I’m sure she would enjoy a visit to say Hi. Many of you have had full suitcases of these items on return trips!